"SFO" redirects here. For other uses, see SFO (disambiguation). 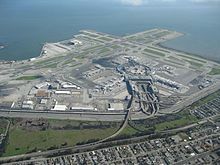 San Francisco International Airport (IATA: SFO, ICAO: KSFO, FAA LID: SFO) is an international airport 13 miles (21 km) south of downtown San Francisco, California, United States, near Millbrae and San Bruno in unincorporated San Mateo County. It has flights to points throughout North America and is a major gateway to Europe and Asia. Unincorporated San Mateo County, California, U.S.
SFO is the largest airport in Northern California and the second busiest in California and on the Western Coast of the Americas, after Los Angeles International Airport. In 2017, it was the seventh-busiest airport in the United States and the 24th-busiest in the world by passenger count. It is the fifth-largest hub for United Airlines and functions as United's primary transpacific gateway. It also serves as a secondary hub for Alaska Airlines. It is a major maintenance hub for United Airlines, and houses the Louis A. Turpen Aviation Museum and Library. SFO is owned and policed by the City and County of San Francisco, but is in San Mateo County. Between 1999 and 2004 the San Francisco Airport Commission operated city-owned SFO Enterprises, Inc., to oversee its business purchases and operations of ventures. The City and County of San Francisco first leased 150 acres (61 ha) at the present airport site on March 15, 1927, for what was then to be a temporary and experimental airport project. San Francisco held a dedication ceremony at the airfield, officially named the Mills Field Municipal Airport of San Francisco, on May 7, 1927, on the 150-acre cow pasture. The land was leased from the Mills Estate in an agreement made with Ogden L. Mills who oversaw the large tracts of property originally acquired by his grandfather, the banker Darius O. Mills. San Francisco purchased the property and the surrounding area expanding the site to 1,112 acres (450 ha) beginning in August 1930. The airport's name was officially changed to San Francisco Airport in 1931 upon the purchase of the land. "International" was added at the end of World War II as overseas service rapidly expanded. The earliest scheduled carriers at the airport included Western Air Express, Maddox Air Lines, and Century Pacific Lines. United Airlines was formed in 1934 and quickly became the key carrier at the airport, with Douglas DC-3 service to Los Angeles and New York beginning in January 1937. A new passenger terminal opened in 1937, constructed with Public Works Administration funding. The March 1939 Official Aviation Guide shows 18 airline departures on weekdays—seventeen United flights and one TWA flight. The aerial view c. 1940 looks west along the runway that is now 28R; the seaplane harbor at right is still recognizable north of the airport. Earlier aerial looking NW 1943 vertical aerial (enlargeable) The August 1952 chart shows runway 1L 7,000 feet long, 1R 7,750 feet, 28L 6,500 feet, and 28R 8,870 feet. In addition to United, Pacific Seaboard Air Lines was operating service between San Francisco and Los Angeles in 1933 with Bellanca CH-300 prop aircraft on a coastal routing of San Francisco – San Jose – Salinas – Monterey – Paso Robles – San Luis Obispo – Santa Maria – Santa Barbara – Los Angeles. Competition with United led Pacific Seaboard to move all of its operations to the eastern U.S., and rename itself Chicago and Southern Air Lines (C&S). It became a large domestic and international air carrier. Chicago & Southern was acquired by and merged into Delta Air Lines in 1953 thus providing Delta with its first international routes . Delta used the route authority inherited from C&S to fly one of its first international services operated with Convair 880 jet aircraft from San Francisco to Montego Bay, Jamaica and Caracas, Venezuela via intermediate stops in Dallas and New Orleans in 1962. During World War II, the airport was used as a Coast Guard base and Army Air Corps training and staging base. Pan American World Airways (Pan Am), which previously operated international flying boat service from Treasure Island, was forced to relocate its Pacific and Alaska seaplane operations to SFO in 1944 after Treasure Island was expropriated for use as a military base. Pan Am began commercial service from SFO in the wake of World War II with five weekly flights to Honolulu, one of which continued on to Canton Island, Fiji, New Caledonia, and Auckland. The first international service by foreign carriers was jointly operated by Australian National Airways (ANA) and British Commonwealth Pacific Airlines (BCPA) with Douglas DC-4 propliners flying a routing of Sydney – Auckland – Fiji – Kanton Island – Honolulu – San Francisco – Vancouver, BC with the inaugural flight departing from Australia on September 15, 1946. By 1947, the airport had become a stop on Pan Am's "round the world" service serving Guam, Japan, the Philippines, China and other countries, and Pan Am also served Sydney from SFO. United Airlines Douglas DC-6 propliners flying to and from Hawaii used the Pan Am terminal beginning in 1947. British Commonwealth Pacific Airlines and Philippine Airlines also began trans-Pacific service to SFO in the late 1940s. TWA began flying nonstop to Europe with Lockheed Constellation propliners (L-1649 models) in 1957. In 1959, Qantas had taken over the ANA/BCPA route from SFO to Sydney and was operating Boeing 707 service to Australia via intermediate stops in Honolulu and Nadi, Fiji. Pan Am attempted to operate Boeing 707-320 jetliners from Tokyo nonstop to SFO in 1960–61 (the westbound nonstops had to await the longer range Boeing 707-320B due to the prevailing winds on the route). Also in 1960, British Overseas Airways Corporation (BOAC, a predecessor of British Airways) was serving the airport with Bristol Britannia turboprops that were flying a westbound routing of London – New York City – San Francisco – Honolulu – Wake Island – Tokyo – Hong Kong as part of the airline's around-the-world service. By the next year, BOAC had replaced the large, British-manufactured Britannia propjets with Boeing 707s now being flown on this intercontinental route, which enabled the airline to eliminate the technical stop at the Wake Island Airfield. Japan Airlines (JAL) was flying Douglas DC-8 jetliners by 1961 on a routing of San Francisco – Honolulu – Tokyo. Also in 1961, Lufthansa had begun serving SFO with Boeing 707s operating a routing of San Francisco – Montreal Dorval Airport – Paris Orly Airport – Frankfurt three days a week. Lufthansa then operated Boeing 720B jets on this same routing in 1963 and was also flying Boeing 707 service to Frankfurt via stops in Montreal and London Heathrow Airport the same year. By 1965, Pan American-Grace Airways, known as Panagra, was operating Douglas DC-8 jets on an international routing of San Francisco – Los Angeles – Panama City, Panama – Lima, Peru – Santiago, Chile – Buenos Aires, Argentina. The Panagra service to Latin America was taken over in the late 1960s by Braniff International, which operated Douglas DC-8-62 long range jetliners into SFO following Braniff's acquisition of Panagra. By 1970, CP Air (formerly Canadian Pacific Air Lines) was flying nonstop to Vancouver, BC with continuing, no change of plane Boeing 737-200 jet service to Winnipeg, Toronto, Ottawa and Montreal. The first nonstops to the U.S. east coast were flown by United with Douglas DC-7 propliners in 1954. The airport's new Terminal Building opened on August 27, 1954. The celebration included in the large static display of aircraft including a Convair B-36 Peacemaker bomber, a marvel for its time. The building became the Central Terminal with the addition of the South Terminal and the North Terminal and was heavily rebuilt as the International Terminal in 1984 and then modified again as the current Terminal 2. Domestically, the April 1957 Official Airline Guide (OAG) lists 71 scheduled weekday departures on United (plus ten flights a week to Honolulu), 22 on Western Airlines, 19 on Southwest Airways (which was later renamed Pacific Air Lines), twelve on Trans World Airlines (TWA), seven on American Airlines and three on Pacific Southwest Airlines (PSA). As for international flights, Pan American had 21 departures a week, Japan Airlines (JAL) had five and Qantas also had five. Southwest Airways began flying scheduled passenger operations from SFO in 1946 with war surplus C-47s, the military version of the Douglas DC-3. In the late 1950s, Southwest Airways changed its name to Pacific Air Lines, which was based at SFO. In 1959, Pacific Air Lines began operating new Fairchild F-27 turboprop aircraft from SFO and by 1966 was flying new Boeing 727-100 jetliners from the airport. 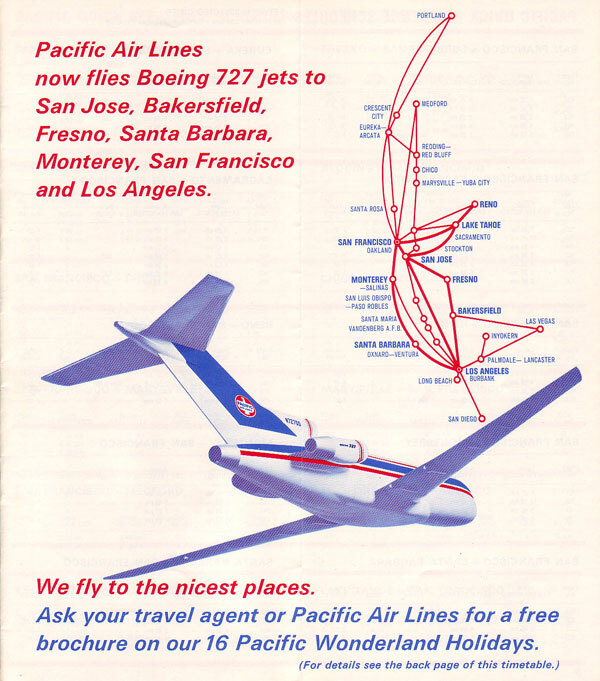 Pacific used the 727 to introduce the first jet service from San Francisco to several destinations in California including Bakersfield, Eureka/Arcata, Fresno, Lake Tahoe, Monterey and Santa Barbara. In 1968, Pacific merged with Bonanza Air Lines and West Coast Airlines to form Air West, which also had its headquarters at SFO. West Coast Airlines had served SFO primarily with Douglas DC-9-10 jet service and Fairchild F-27 turboprop flights to destinations in Oregon and Washington state. In 1970, Air West was acquired by Howard Hughes who renamed the airline Hughes Airwest, which continued to be based at the airport where it also operated a hub. 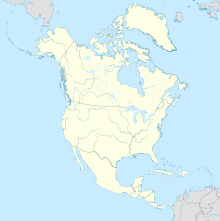 By the late 1970s, the airline was operating an all-jet fleet of Boeing 727-200, Douglas DC-9-10 and McDonnell Douglas DC-9-30 jetliners serving an extensive route network in the western U.S. with flights to Mexico and western Canada as well. Hughes Airwest was eventually acquired by Minneapolis-based Republic Airlines (1979–1986) in 1980 and the airline's corporate headquarters office at SFO was closed. The jet age arrived at SFO in March 1959 when TWA introduced Boeing 707-131 jetliners with nonstop service to New York Idlewild Airport (which was subsequently renamed JFK Airport in 1963). United then constructed a large maintenance facility at San Francisco for its new Douglas DC-8 jets, which were also flying nonstop service to New York. In July 1959 the first jetway bridge was installed at SFO, which was one of the first in the United States. The cover of the January 3, 1960 American Airlines system timetable contained this message: "NOW! 707 JET FLAGSHIP SERVICE – NONSTOP SAN FRANCISCO – NEW YORK: 2 FLIGHTS DAILY"  Also in 1960, Western Airlines was operating "champagne flights" with Boeing 707 jets and Lockheed L-188 Electra propjets to Los Angeles, Seattle, San Diego and Portland, OR. In 1961, the airport had helicopter service operated by San Francisco and Oakland Helicopter Airlines (known as SFO Helicopter Airlines and also as SFO Helicopter) with 68 flights a day. Helicopter flights were operated from the airport to downtown heliports in San Francisco and Oakland, to a new heliport located near the Berkeley Marina and also to Oakland Airport (OAK). In its timetable, SFO Helicopter Airlines, which was based at the airport, described its rotorcraft as "modern, jet turbine powered Sikorsky S-62 ten passenger amphibious helicopters". By 1962, Delta Air Lines was operating Convair 880 jetliners into the airport on one its first international jet services with a routing of San Francisco – Dallas Love Field – New Orleans – Montego Bay, Jamaica – Caracas, Venezuela. Also in 1962, National Airlines began operating multistop transcontinental jet service with Douglas DC-8s flying a routing of San Francisco – Houston Hobby Airport – New Orleans – Miami. Pacific Southwest Airlines (PSA) was operating all of its SFO flights by 1962 with new Lockheed L-188 Electra propjets with nonstop service to Los Angeles (LAX) and Burbank (BUR, now Bob Hope Airport) with direct one stop flights to San Diego (SAN) via LAX or BUR. PSA was operating 14 departures a day on a Monday through Thursday basis to southern California in the summer of 1962 with 21 departures on Fridays and 22 departures on Sundays. By 1965, PSA was operating new Boeing 727-100 jetliners on its intrastate routes in California, which were joined in 1967 by new Boeing 727-200 and McDonnell Douglas DC-9-30 jets. In 1974, PSA was operating new wide-body Lockheed L-1011 TriStar jetliners on flights from SFO nonstop to Los Angeles and Sacramento with direct one stop service to San Diego and was the only intrastate airline in the U.S. ever to operate wide body aircraft. 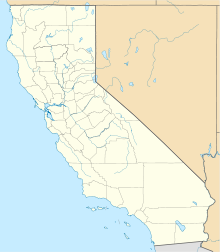 Following the federal Airline Deregulation Act of 1978, PSA then expanded its route system outside of California. By 1967, another intrastate air carrier had joined PSA at SFO: Air California operating Lockheed L-188 Electra propjets nonstop to Orange County Airport (SNA, now John Wayne Airport). Like PSA, Air California (later renamed AirCal) eventually became an all-jet airline and expanded its route network outside of California. AirCal was acquired by and merged into American Airlines while PSA was acquired by and merged into USAir (later renamed US Airways and then eventually merged with American Airlines). The airport closed following the Loma Prieta earthquake on October 17, 1989, reopening the following morning. Minor damage to the runways was quickly repaired. In 1989, a master plan and Environmental Impact Report were prepared to guide development over the next two decades. During the boom of the 1990s and the dot-com boom SFO became the sixth busiest airport in the world, but since 2001, when the boom ended, SFO has fallen out of the top twenty. 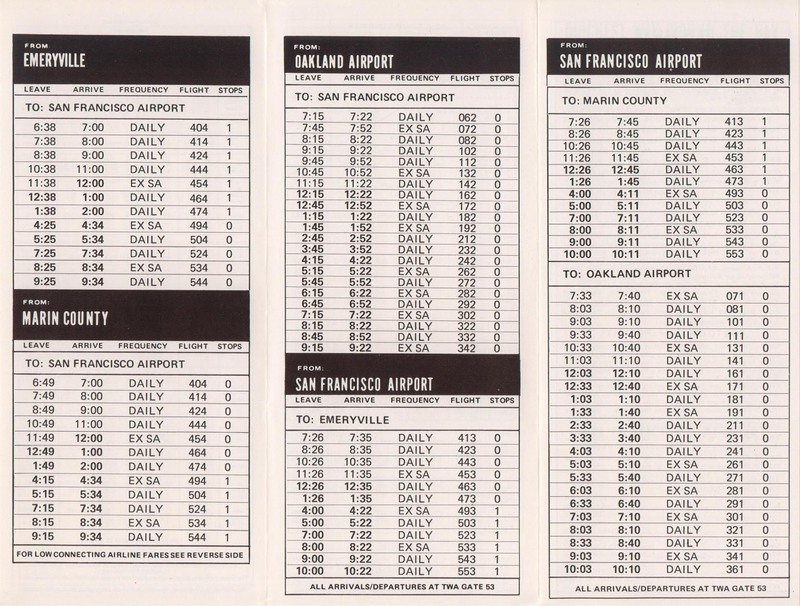 United Express turboprops were scheduled 60 minutes apart to shuttle connecting passengers between SFO and nearby San Jose International Airport during the boom era. United Groundlink supplemented this service with alternate 60-minute frequencies. A $2.4 billion International Terminal Complex opened in December 2000, replacing Terminal 2 (known then as the International Terminal). The new International Terminal includes the San Francisco Airport Commission Aviation Museum and Library and the Louis A. Turpen Aviation Museum, as part of the SFO Museum. SFO's long-running museum exhibition program, now called SFO Museum, won unprecedented accreditation by the American Alliance of Museums in 1999. SFO experiences delays (known as flow control) in overcast weather when only two of the airport's four runways can be used at a time because the centerlines of the parallel runway sets (01R/01L and 28R/28L) are only 750 feet (230 m) apart. Airport planners advanced proposals that would extend the airport's runways by adding up to 2 square miles (1,300 acres; 520 ha) of fill to San Francisco Bay and increase their separation by up to 4,300 feet (1,300 m) in 1998 to accommodate arrivals and departures during periods of low visibility. Other proposals included three floating runways, each approximately 12,000 feet (3,700 m) long and 1,000 feet (300 m) wide. The airport would be required by law to restore Bay land elsewhere in the Bay Area to offset the fill. One mitigation proposal would have the airport purchase and restore the 29,000 acres (12,000 ha) of South Bay wetlands owned by Cargill Salt to compensate for the new fill. These expansion proposals met resistance from environmental groups, including the Sierra Club, fearing damage to the habitat of animals near the airport, recreational degradation (such as windsurfing) and bay water quality. State Senator John L. Burton introduced SB 1562 on February 18, 2000 to bypass the environmental impact study that would normally be required for a large project like the proposed Bay fill and mitigation in order to expedite construction. SB 1562 was signed into law on September 29, 2000. A study commissioned by the airport and released in 2001 stated that alternatives to airport expansion, such as redirecting traffic to other regional airports (Oakland or San Jose), capping the number of flights, or charging higher landing fees at selected times of the day 2001 would result in higher fares and poorer service. However, the proposal to build new runways on Bay fill continued to attract opposition from environmental groups and local residents. The airport expansion cost was estimated at US$1,400,000,000 (equivalent to $2,150,000,000 in 2018) in 1998, rising to US$2,200,000,000 (equivalent to $3,310,000,000 in 2018) a year later, including an estimate of US$200,000,000 (equivalent to $301,000,000 in 2018) for the Cargill wetlands purchase and restoration. The delays during poor weather (among other reasons) caused some airlines, especially low-cost carriers such as Southwest Airlines, to shift all of their service from the airport to Oakland and San Jose. However, Southwest eventually returned to SFO in 2007. A long-planned extension of the Bay Area Rapid Transit (BART) system to the airport opened on June 22, 2003, allowing passengers to board BART trains at the international or domestic terminals and have direct rail transportation to downtown San Francisco, Oakland, and the East Bay. On February 24, 2003, the AirTrain people mover opened, transporting passengers between terminals, parking lots, the BART station, and the rental car center on small automatic trains. SFO became the base of operations for start-up airline Virgin America, with service to over 20 destinations. On October 4, 2007, an Airbus A380 jumbo jet made its first visit to SFO. 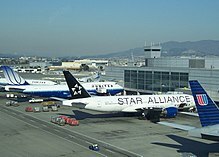 On July 14, 2008 SFO was voted Best International Airport in North America for 2008 in the World Airports Survey by Skytrax. The following year on June 9, Skytrax announced SFO as the second-best International Airport in North America in the 2009 World Airports Survey, losing to Dallas/Fort Worth International Airport. 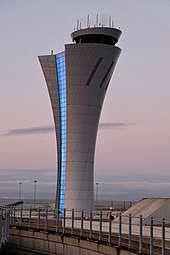 In response to longstanding FAA concerns that the airport's air traffic control tower, located atop Terminal 2, could not withstand a major earthquake, on July 9, 2012, crews broke ground for a new torch-shaped tower. The new tower is located between Terminals 1 and 2, and the base of the tower building contains passages between the two terminals for passengers both pre- and post-security screening, which dictated the narrow tower base. Originally scheduled for completion in the summer of 2016 at a cost of $102 million, the new tower began operations on October 15, 2016. SFO was one of several US airports that operated the Registered Traveler program from April 2007 until funding ended in June 2009. This program let travelers who had paid for pre-screening pass through security checkpoints quickly. Baggage and passenger screening is operated by Covenant Aviation Security, a Transportation Security Administration contractor, nicknamed "Team SFO". SFO was the first airport in the United States to integrate in-line baggage screening into its baggage handling system and has been a model for other airports since the September 11 attacks in 2001. Runways are named for their magnetic heading, to the nearest ten degrees; hence the runways at 14° from magnetic north are 01L/01R, and the runways at 284° are 28R/28L. The layout of the parallel runways (1L/1R and 28R/28L) was established in the 1950s, and have a separation (centerline to centerline) of only 750 feet (230 m). During normal operations (approximately 81% of the time), domestic departures use Runways 1L and 1R for departure while overseas international departures and all arrivals use Runways 28L and 28R, taking advantage of the prevailing west-northwesterly wind coming through the San Bruno Gap. During periods of heavy winds or if operations at Oakland International Airport conflict with SFO departures (approximately 15% of the time), Runways 1L and 1R cannot be used, and so all departures and all arrivals use Runways 28L and 28R. These configurations are known collectively as the West Plan, and accommodate arrivals at a rate of up to 60 aircraft per hour. Under visual flight rules, aircraft may safely land side-by-side essentially simultaneously on 28L and 28R while maintaining visual separation. When the visual approach is compromised, the West Plan is maintained with a modification to allow aircraft landing on 28L to use Instrument Landing System (ILS) while the aircraft landing on 28R takes an offset course, monitored via high scan rate ground radar, to maintain a lateral spacing greater than 750 ft until the aircraft are able to maintain visual separation. Visual separation typically occurs once the aircraft have descended below the cloud deck at an altitude of 2,100 feet (640 m). This is known as the Precision Runway Monitor/Simultaneous Offset Instrument Approach, and reduces the capacity to 36 arriving aircraft per hour. In poor visibility conditions, FAA instrument approach rules require aircraft to maintain lateral separation of 4,300 feet (1,300 m), meaning only one runway may be used, reducing the capacity of SFO to 25-30 arriving aircraft per hour. During rainstorms (approximately 4% of the time), the prevailing winds shift to a south-southeasterly direction, and departing aircraft use Runways 10L and 10R and arriving aircraft use Runways 19L and 19R. This configuration is known as the Southeast Plan. On rare occasions (less than one day per year, on average), wind conditions dictate other runway configurations, including departures and landings on Runways 10L and 10R, departures and landings on Runways 1L and 1R, and departures on Runways 19L and 19R and landings on Runways 28L and 28R. SFO was one of the first airports to implement a Fly Quiet Program, which grades airlines on their performance on noise abatement procedures while flying in and out of SFO. The Jon C. Long Fly Quiet Program was started by the Aircraft Noise Abatement Office to encourage airlines to operate as quietly as possible at SFO. SFO was one of the first U.S. airports to conduct a residential sound abatement retrofitting program. Established by the FAA in the early 1980s, this program evaluated the cost effectiveness of reducing interior sound levels for homes near the airport, within the 65 CNEL noise contour. The program made use of a noise computer model to predict improvement in specific residential interiors for a variety of noise control strategies. This pilot program was conducted for a neighborhood in South San Francisco and success was achieved in all of the homes analyzed. The costs turned out to be modest, and the post-construction interior sound level tests confirmed the predictions for noise abatement. To date over $153 million has been spent to insulate more than 15,000 homes in the neighboring cities of Daly City, Pacifica, San Bruno, and South San Francisco. 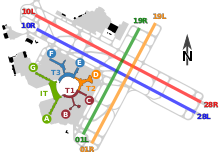 The airport has four terminals (1, 2, 3, and International) and seven concourses (Boarding Areas A through G) with a total of 115 gates arranged alphabetically in a counterclockwise ring. Terminal 1 (Boarding Areas B and C), Terminal 2 (Boarding Area D), and Terminal 3 (Boarding Areas E and F) handle domestic flights (including precleared flights from Canada). The International Terminal (Boarding Areas A and G) handle international flights and some domestic flights. Historically, the oldest terminal building still standing is Terminal 2, completed in 1954 as the Central Terminal with four concourses (Piers B, C, D, and E, lettered sequentially from north to south). Terminal 1 was added as the South Terminal in 1963 with Piers F/FF (Pier F had two satellite rotundas) and G, and Pier E was reassigned to the South Terminal upon its completion. International traffic was routed through Pier G, and a new Rotunda G was completed in 1974 to expand Pier G. Terminal 3 was added as the North Terminal in 1979 with Pier A. Also once the North Terminal was completed in 1979, the piers were renamed counterclockwise, with letter designations corresponding to present-day Boarding Areas, starting with Pier A (present-day Boarding Area A, originally Pier G), Pier B (present-day Boarding Area B, originally Pier F/FF), and Pier C (present-day Boarding Area C, originally Pier E). A new Pier E was added to the North Terminal in 1981 approximately where the old Pier B stood, and the Central Terminal was rebuilt with a single pier (D) to serve international flights in 1983, until a new International Terminal opened in 2000. Since then, the terminals were renamed with numbers in 2001, and the older terminals are in the process of renovation. A rebuild of Terminal 2 (formerly the Central Terminal) completed in 2011, followed by the completed rebuild of Terminal 3 (North Terminal) in 2015, and a projected rebuild of Terminal 1 (South Terminal) is scheduled to be complete by 2024. There exist two airside connectors at SFO that enable passengers to roam (post-security) between adjacent terminal buildings. A short airside connector links T3's Boarding Area F (adjacent to Amex Centurion Lounge) to the International Terminal Boarding Area G. An airy 500-foot airside connector links T1's Boarding Area C to T2. 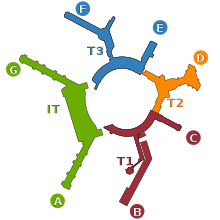 There are no airside connectors between: T1 and International Boarding Area A; T2 and T3; International Boarding Areas A and G (the main terminal area of the International Terminal separates the two boarding areas). By approximately 2020 to 2022, the demolition and rebuild of the southern portion of T1 (Boarding Area B) will have been completed and an airside connector to International Boarding Area A will be added. By 2024, renovation of Boarding Area C will add a airside connection between it and the rest of renovated Terminal 1. This means the airport will be split into two sections, with International Boarding Area G connected to Terminal 3 on the northwestern side and Terminals 1 and 2 connected to International Boarding Area A on the southeastern side. Formerly known as the "South Terminal", Terminal 1 is composed of Boarding Area B, which has 24 gates (gates 20–23, 24A–B, 25–31, 32A–C, 33–35, 36A–B, 37–39), and Boarding Area C, which has 10 gates (gates 40–44, 45A–B, and 46–48). A third boarding area, Rotunda A, was demolished in early 2006, as its functions had been taken over by the new International Terminal. The South Terminal, which cost US$14,000,000 (equivalent to $114,570,000 in 2018), was initially dedicated on September 15, 1963. The terminal was designed by Welton Becket and Associates. When it opened, the South Terminal had three piers: Pier G (for international flights, approximately at the same location as the present-day Boarding Area (B/A) A in the International Terminal), Pier F/FF (used by Trans World Airlines (TWA) and Western Airlines, later renamed B/A B), and Pier E (used by American Airlines; originally part of Terminal 2, approximately at the present-day B/A C). The three-level Rotunda A addition was completed in 1974 at the end of Pier G. When the North Terminal was completed in 1979, Pier G was renamed Pier A, with the other piers renamed in a counterclockwise direction proceeding from the new Pier A. International flights were moved to the rebuilt Central Terminal (Terminal 2) in 1983, and then to the new International Terminal in 2000. The South Terminal underwent a US$150,000,000 (equivalent to $317,770,000 in 2018) renovation designed by Howard A. Friedman and Associates, Marquis Associates and Wong & Brocchini that was completed in 1988. Terminal 1 is undergoing a US$2,400,000,000 (equivalent to $2,505,490,000 in 2018) project to modernize the concourse and add gates; the project broke ground on June 29, 2016. The phase of the project to expand Boarding Area B includes the demolition of the old TWA hangar, the demolition of the two rotundas, and the relocation of two taxiways. The multi-phase project will yield a total of 24 gates when complete in 2020 (the existing Boarding Area B has fewer than 20 usable gates), including a secure Federal Inspection Services (FIS) connector to the existing customs facilities in the International Terminal. This will effectively add six new gates that can handle international arrivals. Planning for a renovation of Boarding Area C is underway, with construction to commence after the completion of work on Boarding Area B. The projected completion date for Boarding Area C work is mid-2024. As of March 2018, the San Francisco Board of Supervisors is preparing to rename Terminal 1 after deceased gay rights activist and former supervisor Harvey Milk and install artwork memorializing him. This follows after a previous attempt to rename the entire airport after him was turned down. Terminal 2, formerly known as the "Central Terminal", opened in 1954 as the main airport terminal. 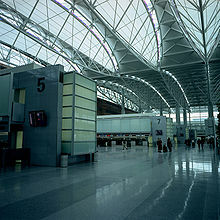 After a drastic rebuilding designed by Gensler, it replaced Rotunda A as SFO's international terminal in 1983 until it was closed for renovation after the current international terminal opened in 2000. The initial plan was to convert Terminal 2 for domestic travel and reopen it by fall 2001, but the loss of passenger traffic after the terrorist attacks of September 11, 2001 put those plans on hold. The upper levels continued to be used as office spaces and for the airport's medical clinic, and the control tower remained in use. On May 12, 2008, a US$383,000,000 (equivalent to $445,690,000 in 2018) renovation project was announced that included a new control tower, the use of green materials, a seismic retrofit, and an expansion from ten to fourteen gates. The terminal reopened for commercial travel on April 14, 2011, with Virgin America (later Alaska Airlines) and American Airlines sharing the new 14-gate common-use facility. Approximately a week earlier, on April 6, 2011, Virgin America's ceremonial flight VX2001 was the first to arrive at the renovated Terminal 2, an Airbus A320 bearing founder Richard Branson with other invited celebrity guests, such as Buzz Aldrin, Rachel Hunter, and Gavin Newsom. VX2001 had rendezvoused with White Knight Two/SpaceShipTwo over Point Reyes before making a side-by-side landing. The newly-renovated terminal also designed by Gensler features permanent art installations from Janet Echelman, Kendall Buster, Norie Sato, Charles Sowers, and Walter Kitundu. Transition zones (the immediate post-security line area for "passenger recomposure") and exit areas (where disembarking passengers may be greeted) were designed with generous space. Terminal 2 set accolades by being the first U.S. airport to achieve LEED Gold status. Paolo Lucchesi, a local food critic, noted the sustainable food and dining program featuring local vendors and sources. Its only concourse is Boarding Area D, which has 14 gates (gates 50, 51A, 51B, 52, 53, 54A, 54B, 55, 56A, 56B, 57, 58A, 58B, 59). The control tower and most operations offices were (and still are) located on the upper levels, and the departure and arrival areas served as walkways between Terminals 1 and 3. American's check-in counters have been consolidated to T2, but American's operation is split between T2's Boarding Area D and T1's Boarding Area C (linked via an airside connector). Terminal 2 hosts an Admirals Club. Formerly known as the "North Terminal", Terminal 3 has Boarding Area E with 10 gates (gates 60–69) and Boarding Area F with 29 gates (gates 70, 71A–B, 72–76, 73A, 77A–C, 78–83, 84A–D, 85–90, and 87A). Terminal 3 is used for United Airlines' domestic flights. Mainline United flights use both boarding areas, while United Express regional flights use Boarding Area F.
This $82.44 million terminal was originally designed by San Francisco Airport Architects (a joint venture of John Carl Warnecke and Associates, Dreyfuss + Blackford Architecture, and minority architects). The groundbreaking ceremony for the North Terminal was held on April 22, 1971, and Boarding Area F opened in 1979 and Boarding Area E opened in 1981. All terminals (except the International Terminal) were redesignated by number starting October 1, 2001. A solar roof was installed in 2007 with sufficient generating capacity to power all Terminal 3 lights during the day. American Airlines and Air Canada occupied Boarding Area E until it closed for refurbishment in 2011 under the airport's FY 2010/11 – FY 2014/15 Capital Plan. Designed by Gensler, the renovation. included architectural enhancements, structural renovations, replacement of HVAC systems, roof repair, and new carpeting. Initial modest renovation plans were replaced by a more ambitious project after the popularity of the remodeling of Terminal 2. After the completion of the US$138,000,000 (equivalent to $146,050,000 in 2018) project, Terminal 3 reopened on January 28, 2014. The project moved one gate from Boarding Area F to Boarding Area E to provide a total of ten aircraft parking positions at T3E. There are three United Clubs in Terminal 3—one near the rotunda for Boarding Area F, one on the mezzanine across from gate 71A, and another in the beginning of Boarding Area E. Terminal 3 also houses the American Express Centurion Lounge, located across from Gate 74. The International Terminal is composed of Boarding Areas A and G. Designed by Craig W. Hartman of Skidmore, Owings and Merrill, the terminal opened in December 2000 to replace the International Departures section of Terminal 2. It is the largest international terminal in North America, and the largest building in the world built on base isolators to protect against earthquakes. Food service focuses on quick service versions of leading San Francisco Bay Area restaurants, following other SFO terminals. Planners attempted to make the airport a destination in and of itself, not just for travelers passing through. The international terminal is a common-use facility, with all gates and all ticketing areas shared among international airlines and several domestic carriers. Common-use terminal equipment (CUTE) is used at check-in counters and gates. All international arrivals and departures are handled here (except flights from cities with customs preclearance). The International Terminal houses the airport's BART station, adjacent to the garage leading to Boarding Area G. The SFO Medical Clinic is located next to the security screening area of Boarding Area A. All gates in this terminal have at least two jetway bridges, except gates A2 and A10, which have one. Gates A1, A3, and A11 can accommodate two aircraft. Six of the gates are designed for the Airbus A380, making SFO one of the first airports in the world with such gates when it was built in 2000. Gates A9 (9A, 9B, 9C) and G101 (101A, 101B, 101C) have three jetways for boarding. Four other gates have two jetways fitted for A380 service. The International Terminal completed a continuous ring of terminals, by filling in the last remaining gap to the west of then-existing terminals. Its geometry required that the terminal structure be built above the main access road, at enormous expense, including building dedicated ramps for connectivity to Highway 101. The design and construction of the international terminal was by Skidmore, Owings & Merrill, Del Campo & Maru Architects, Michael Willis Associates, and built by Tutor Perini (main terminal building), Hellmuth, Obata and Kassabaum in association with Robin Chiang & Company, Robert B. Wong Architects, and built by Tutor Perini (Boarding Area G), and Gerson/Overstreet Architects and built by Hensel Phelps Construction (Boarding Area A). The contracts were awarded after an architectural design competition. Most international flights operated by Star Alliance carriers, including all United international flights and select United domestic flights, are assigned to Boarding Area G's 15 gates (G91, G92–G92A, G93–G98, G99–G99A, G100, G101–G101A, G102) and three remote parking stands. Most international flights operated by SkyTeam, Oneworld, and non-aligned international carriers board and deplane at Boarding Area A's 13 gates (gates A1–A10, A11–A11A, A12). However, Star Alliance carrier Avianca El Salvador operates out of Boarding Area A, and non-aligned carriers Aer Lingus, Fiji Airways, WestJet (select flights), and WOW air have designated gates located at Boarding Area G. Boarding Area A is also used by domestic carriers Alaska Airlines, JetBlue Airways, Sun Country Airlines, and Hawaiian Airlines. When all gates in an airline's designated international boarding area are full, the passengers will board or deplane from the opposite international boarding area. Air Canada, Aer Lingus, and WestJet operate from airports with United States border preclearance, allowing arriving passengers to skip the wait at customs and immigration when they arrive at SFO, and exit the airport from the departure level. Frequent travelers and airline staff have reportedly told SFO Museum officials they make it a point to arrive to the airport early in order to view the galleries. AirTrain is the airport's landside people-mover system. Fully automated and free of charge, it connects all four terminals, the two international terminal garages, the BART station, and the airport's Rental Car Center. The San Francisco International Airport (SFO) BART station, located in Parking Garage G of the International Terminal, is the only direct rail link between the airport, the city of San Francisco, and the general Bay Area. The SFO station is served by the Antioch–SFO/Millbrae line and the SFO–Millbrae line. BART is SFO's connection to Caltrain at the Millbrae Station, which requires a transfer at the San Bruno station during most of BART's weekday operating hours; direct BART service between SFO and Millbrae is available on weekday evenings, weekends, and holidays. Caltrain used to offer a free shuttle to SFO airport from the Millbrae station, but it was replaced by BART service when the SFO extension was completed. Route SFO direct service from the Millbrae Transit Center (Caltrain and BART). Route 140 provides local service from the Rental Car Center (accessible via AirTrain) to San Bruno, South San Francisco, and Pacifica, stopping at San Bruno Caltrain, San Bruno BART, and Skyline College for connections within San Mateo County and beyond. Route 292 serves the airport daily between San Francisco and Hillsdale Mall via Bayshore Boulevard and Downtown San Mateo. Route 397 operates to the airport during the overnight hours as a part of the Bay Area's "All Nighter" service. This service mirrors that of Route 292 north of the airport (with an additional stop at Civic Center BART/Muni Metro Station), with service continuing south via Millbrae BART/Caltrain Station and El Camino Real to and from Palo Alto Caltrain. Route 398 serves the airport and it runs between San Francisco and Redwood City Caltrain. Route 399 operates to the airport during the overnight hours as a part of the Bay Area's "All Nighter" service. This service mirrors that of Routes 120, 140, and ECR north of the airport (with an additional limited stop at Daly City BART Station), serving San Bruno and South San Francisco before terminating at Mission Street and Wellington Avenue in Daly City, where passengers can connect to MUNI's All Nighter 14 Mission Route. Samtrans can be accessed on the arrivals/baggage claim level of the domestic terminals and in courtyard A or G in the International Terminal. Numerous door-to-door "shared ride" van and hotel courtesy shuttles stop at the center transportation island on the departure level, while airporter and limousine are on the arrivals/baggage claim level of the airport. Charter services are also available in the courtyards. The airport is located on U.S. Route 101, 13 miles (21 km) south of downtown San Francisco. It is near the US 101 interchange with Interstate 380, a short freeway that connects US 101 with Interstate 280. The airport provides both short-term and long-term parking facilities. Short term parking is located in the central terminal area and two international terminal garages. Long term parking is located on South Airport Blvd. and San Bruno Ave. and are served by shuttle buses. Passengers can also park long-term at a select number of BART stations that have parking lots, with a permit purchased online in advance. Taxis depart from designated taxi zones located at the roadway center islands, on the Arrivals/Baggage Claim Level of all terminals. Ride share services (or transportation network companies) such as Uber are available via their respective mobile app. Due to local regulations, curbside pick up must occur at each terminal's departure (not arrival) level. SFO is home to the one of the largest single aircraft maintenance bases in the world with complete MRO base operations (maintenance, repair, overhaul, painting, welding, machine shop, tool and die, parts manufacturing, fabrication, engineering, and retrofitting (Boeing and Airbus certified, among others). It serves as the principal Global MRO Base for United Airlines and serves over 40 other airlines, military customers, and aircraft lease operators. Nippon Cargo Airlines has its San Francisco branch on the airport property. Prior to its merger that formed Air West, Pacific Air Lines had its corporate headquarters on the grounds of the airport. Hughes Airwest, the successor to Air West, also had its headquarters on the grounds of the airport. The United States Coast Guard operates Coast Guard Air Station San Francisco with its own ramp and buildings near the cargo terminal, operating 6 MH-65 Dolphin helicopters. On February 9, 1937, a United Airlines Douglas DC-3A-197 transport liner circled the airport, then crashed into the bay, killing 11 people. On September 12, 1951, United Airlines Flight 7030 plunged into the bay during a training exercise killing all three crew members. On October 29, 1953, British Commonwealth Pacific Airlines flight 304, a Douglas DC-6 en route from Sydney, Australia, with fuel stops in Auckland, New Zealand, Fiji, and Honolulu, crashed on approach to SFO into Kings Mountain in San Mateo County. All 19 passengers and crew members died. On February 20, 1959, a Pan American DC-7C crashed and burned on the runway. The three crew members on board survived. On February 3, 1963, Slick Airways Flight 40 crashed and burned after striking approach lights on runway 28R, killing the four people on board. On December 24, 1964, Flying Tiger Line Flight 282, a Lockheed Constellation cargo aircraft departing for New York City, crashed in the hills west of the airport, killing all three crew members on board. On June 28, 1965, Pan Am Flight 843, a Boeing 707, had just departed for Honolulu, Hawaii, when its #4 engine exploded, causing part of the wing and the engine itself to break off and fall into the streets below. The crew were able to extinguish the ensuing fire and land safely at the nearby Travis Air Force Base. On November 22, 1968, a Japan Air Lines DC-8, named the Shiga, operating Flight 2, crash-landed on final approach at 9:30 a.m. on a shallow submerged reef at the eastern tip of Coyote Point (three miles short of the runway southeast of the airport). The plane was on a trip from Tokyo to San Francisco, after making a stop in Honolulu. The pilot was experienced, but apparently misread the instruments on the DC-8, which was less than a year old. There were 107 people on the plane. There were no deaths or serious injuries. The plane was salvaged by Bigge Drayage Company soon after the crash. All luggage and fuel were removed to cut the weight and the plane was lifted onto a barge and taken to the airport for repairs. The cost of repairs was $4 million and the plane re-entered service the following April. On July 30, 1971, Pan Am Flight 845, a Boeing 747 (registration: N747PA, name: Clipper America), struck navigational aids at the end of runway 1R on takeoff for Tokyo. The aircraft's landing gear and other systems were damaged. Two passengers were seriously injured by metal components of the runway approach light pier entering the cabin. The flight proceeded out over the Pacific Ocean to dump fuel to reduce weight for an emergency landing. Emergency services deployed at the airport, and the plane returned and landed on runway 28R. During landing the aircraft veered off the runway. There was no fire. After coming to a stop, the aircraft slowly tilted aft, coming to rest on its tail in a nose-high attitude. The forward evacuation slides were therefore in a nearly vertical position. Evacuation using these slides caused all of the additional injuries, some severe. There were no fatalities among the 218 passengers and crew members aboard. An investigation determined that the cause of the accident was erroneous information from the flight dispatcher to the crew members regarding weight and runway length. On September 13, 1972, TWA Flight 604, a Boeing 707-331C cargo plane crashed into the bay on takeoff. All three crew members survived. On February 15, 1985, China Airlines Flight 006 made an emergency landing after experiencing an uncontrolled descent over the Pacific Ocean. United Flight 93 from Newark NJ destined to San Francisco International Airport was the fourth airplane that was hijacked in the September 11 attacks. On May 26, 2007, an arriving SkyWest Airlines Embraer EMB 120 nearly collided with a Republic Airline Embraer 170 Regional Jet at the junction of Runways 01L and 28R. After the SkyWest EMB 120 passed the Runway 28R threshold, the Republic E-170 was cleared for takeoff on 01L, in contradiction to local and FAA orders requiring the arriving aircraft to pass the intersection before clearing departing aircraft on the intersecting runway. On June 28, 2008, an ABX Air Boeing 767 preparing to depart with cargo caught fire and was seriously damaged. The pilots escaped uninjured. Although the airline had received a threat the week before, investigations revealed no evidence of any malicious device on board, eventually concluding the fire was caused by an electrical system malfunction. On July 6, 2013, Asiana Airlines Flight 214, a Boeing 777-200ER registered HL7742, crashed while landing. The crash occurred due to a combination of mistakes made by the aircraft's flight crew. The flight crew had selected an incorrect autopilot mode when attempting to descend, followed by placing the thrust levers into "idle", which disabled the autopilot from maintaining speed as the aircraft approached the seawall. Upon descending below the desired flight path, the flight crew should have determined that their speed was too low and attempt a "go-around" and re-attempt to land; however, this decision was not made. The tail section of the aircraft struck the seawall at the end of the runway and became detached from the airframe; the plane ended up 2,000 feet (610 m) down the runway. Passengers and crew members evacuated before fire, due to ignited engine lubricating oil, destroyed the aircraft. There were three fatalities, making this the first fatal Boeing 777 crash. On July 7, 2017, Air Canada Flight 759, an A320-200 was instructed by air traffic control to go around after overflying Taxiway C for 0.25 miles (400 m) while on visual approach for 28R. The A320 overflew the first two aircraft lined up on Taxiway C by roughly 100 feet (30 m). The pilots landed the aircraft afterwards without incident. A total of three wide-body aircraft and one narrow-body aircraft were lined up awaiting takeoff on Taxiway C. The NTSB launched an investigation into the incident, publishing the final report in September 2018. The climax of the Steve McQueen movie Bullitt (1968) was filmed at the airport. Jet aircraft operated by Pacific Southwest Airlines (a PSA Boeing 727) and Pan American World Airways (a Pan Am Boeing 707) were prominently featured in the scenes filmed at SFO. The short-lived television series San Francisco International Airport (1970) was set at the airport. In the 1994 Dale Brown novel Storming Heaven, the airport is subject to a massive terror attack. The airport was used as a location of the beginning of the 1996 movie Homeward Bound II: Lost in San Francisco. The opening and closing scenes of What's Up Doc (Barbra Streisand, Ryan O'Neal – 1972) were filmed in the departure / ticket and baggage claim areas of what was known as the South Terminal (now Terminal 1). Dirty Harry foils a hijacking at the airport in the 1973 film Magnum Force. The airport was featured in the 2004 video game Grand Theft Auto: San Andreas as Easter Bay International Airport. The destination of the principal aircraft in the 1954 film The High and the Mighty, a Douglas DC-4, is the airport. The film's climax takes place there, but was filmed in Burbank, California. The airport stood in for Honolulu International Airport in the 2014 movie Godzilla. Part of the tenth episode of the fifteenth season of Family Guy, Passenger Fatty-Seven, took place at the airport. The airport appears briefly in San Andreas after being destroyed by a 9.6 magnitude earthquake. ^ a b "Air Traffic Statistics". flySFO.com. San Francisco International Airport. Retrieved February 5, 2017. ^ "Air Traffic Statistics". San Francisco International Airport. January 2016. Retrieved July 12, 2016. ^ "San Francisco International Airport". Geographic Names Information System. United States Geological Survey. Retrieved May 3, 2009. ^ "Airports Council International – Worldwide Airport Traffic Report – Calendar Year 2017" (PDF). The Port Authority of NY & NJ. ^ Smith, Matt (March 28, 2001). "Flying Blind". SF Weekly. Retrieved August 3, 2009. ^ "Financial Audits". City and County of San Francisco. January 22, 2007. Retrieved August 3, 2009. ^ "SFO Enterprises, Inc". SF Weekly. Archived from the original on July 26, 2011. Retrieved August 3, 2009. ^ The Shock Doctrine, Naomi Klein; pg. 396. ^ a b c d e f "History of SFO". San Francisco International Airport. Retrieved July 14, 2017. ^ "negative: Mills Field Municipal Airport of San Francisco". SFO Museum. May 7, 1927. Retrieved November 10, 2015. ^ "Pacific Seaboard Air Lines". Airline Timetable Images. Summer 1933. Retrieved August 28, 2015. ^ "Family". Delta Flight Museum. Retrieved August 28, 2015. 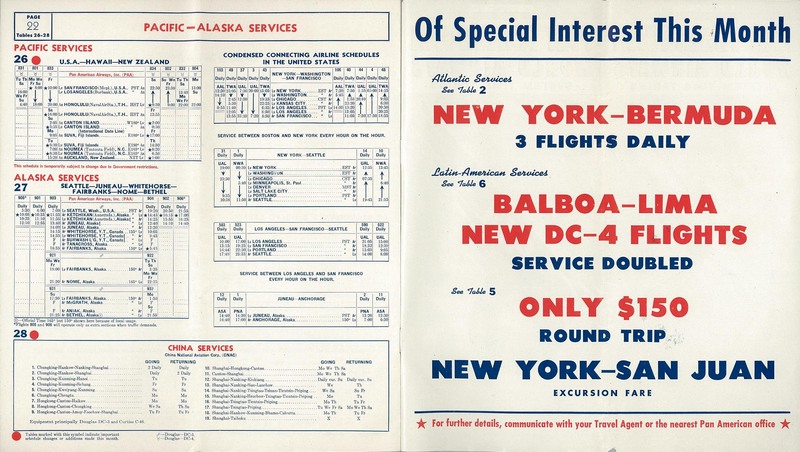 ^ a b "Delta Air Lines system timetable". February 1, 1962. Retrieved August 28, 2015. ^ "Pan Am timetable, 1946". ^ "British Commonwealth Pacific Airlines". Airline Timetable Images. ^ "Pan Am timetable, 1947". ^ "Qantas Timetable". Airline Timetable Images. November 6, 1959. Retrieved August 28, 2015. 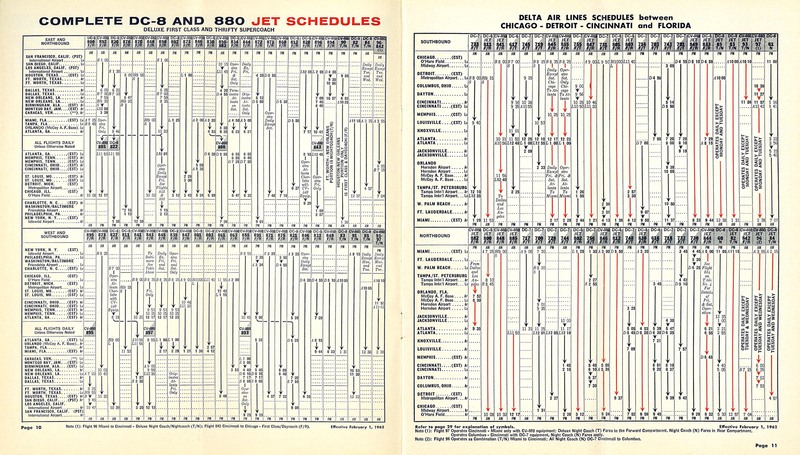 ^ "BOAC system timetable". Airline Timetable Images. April 24, 1960. Retrieved August 28, 2015. ^ "BOAC system timetable". Airline Timetable Images. August 1, 1961. Retrieved August 28, 2015. ^ "Japan Airlines system timetable". Airline Timetable Images. December 1, 1961. Retrieved August 28, 2015. ^ "Lufthansa system timetable". Airline Timetable Images. April 1, 1961. Retrieved August 28, 2015. ^ "Lufthansa system timetable". Airline Timetable Images. January 1, 1963. Retrieved August 28, 2015. ^ "Panagra system timetable". Airline Timetable Images. August 1, 1965. Retrieved August 28, 2015. 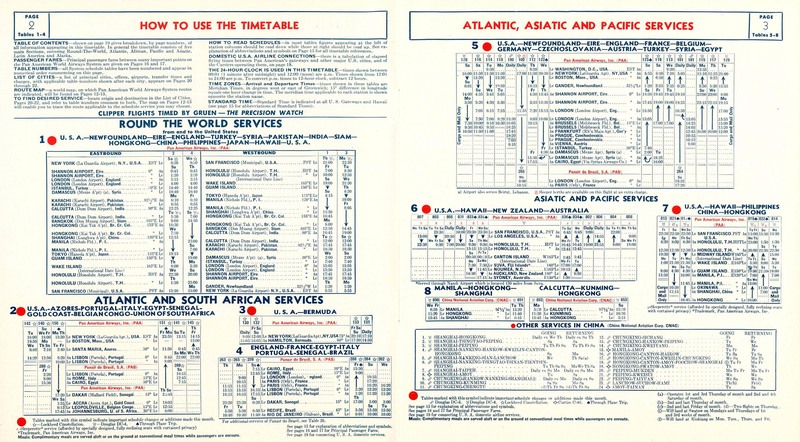 ^ "Braniff International system timetable". Airline Timetable Images. July 1, 1968. Retrieved August 28, 2015. ^ "CP Air system timetable". Airline Timetable Images. July 15, 1970. Retrieved August 28, 2015. ^ Fredricks, Darold (July 1, 2013). "Convair B-36 'Peacemaker'". San Mateo Daily Journal. Retrieved 4 August 2017. ^ a b Wilson, Marshall (December 4, 2000). "A Guide to the New International Wing". San Francisco Chronicle. Hearst Communications. pp. A–1. Retrieved August 3, 2009. ^ "Southwest Airways – The Pacific Air Line system timetable". Airline Timetable Images. April 28, 1957. Retrieved August 28, 2015. 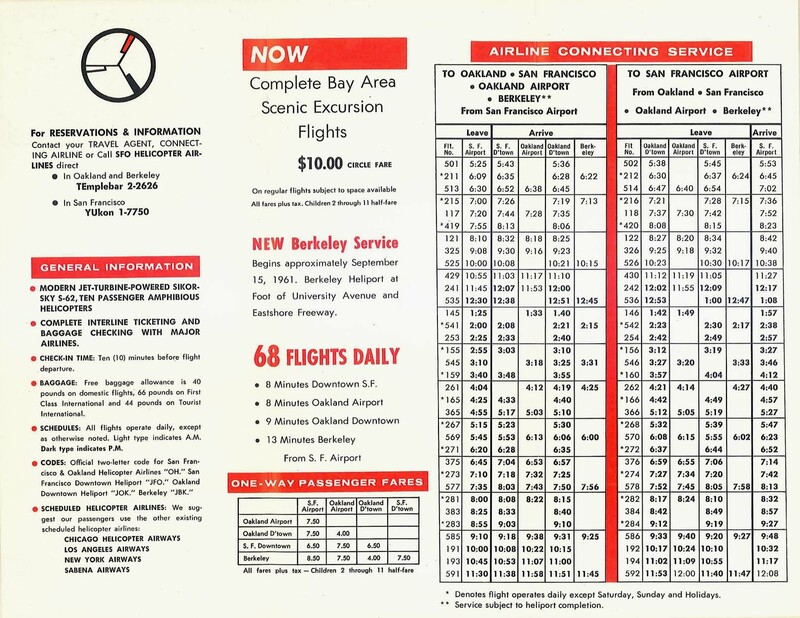 ^ "Pacific Air Lines system timetable". Airline Timetable Images. July 1, 1959. Retrieved August 28, 2015. ^ "Pacific Air Lines route map". AirTimes – A Source for Airline History. July 20, 1966. Retrieved August 28, 2015. 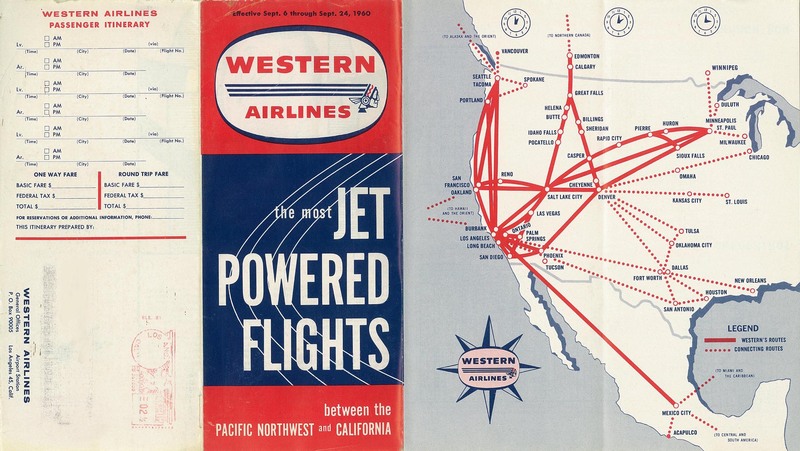 ^ "West Coast Airlines route map". departedflights.com. April 28, 1968. Retrieved December 13, 2017. ^ "Hughes Airwest route map". departedflights.com. January 15, 1978. Retrieved 13 December 2017. ^ "American Airlines" (PDF). 1960s Airline & Airliner Antiques. January 3, 1960. Retrieved August 28, 2015. 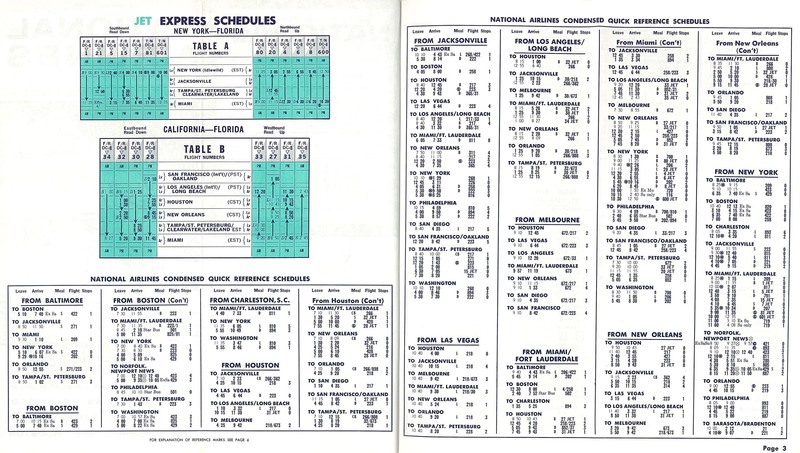 ^ "Western Airlines system timetable". Airline Timetable Images. September 6, 1960. Retrieved August 28, 2015. ^ "SFO Helicopter Airlines". Airline Timetable Images. September 1, 1961. Retrieved August 28, 2015. ^ "SFO Helicopter Airlines". Airline Timetable Images. October 26, 1975. Retrieved August 28, 2015. ^ "National Airlines". Airline Timetable Images. March 2, 1962. Retrieved August 28, 2015. ^ "PSA – Pacific Southwest Airlines". Airline Timetable Images. June 25, 1962. Retrieved August 28, 2015. ^ a b "PSA History". Pacific Southwest Airlines History Page. Retrieved August 28, 2015. ^ Roderick, Kevin (October 19, 1989). "Search For Bodies to Take Days—State Puts Toll at 273, Then Says It Is Uncertain". Los Angeles Times. Retrieved September 5, 2009. ^ Christopher H. Schmitt, Mercury News (October 10, 2014). "Loma Prieta earthquake: The Mercury News' first-day coverage, afternoon paper". Mercury News. ^ Environmental Impact Report for the San Francisco International Airport Master Plan (Report). Earth Metrics Inc. and Jefferson Associates, prepared for the city of San Francisco and California State Clearinghouse. 1989. ^ "Airports Council International – Worldwide Airport Traffic Report – Calendar Year 2013" (PDF). The Port Authority of NY & NJ. ^ "San Francisco Airport Commission Aviation Library & Louis A. Turpen Aviation Museum". SFO Museum. San Francisco Airport Commission. November 10, 2015. Retrieved November 10, 2015. ^ "San Francisco Airport Commission Aviation Library & Louis A. Turpen Aviation Museum – Mission Statement and History". SFO Museum. San Francisco Airport Commission. November 10, 2015. Retrieved November 10, 2015. ^ McCabe, Michael (18 November 1999). "Wind Over Water / Planes would land on floating runways built on S.F. Bay". San Francisco Chronicle. Retrieved 4 August 2017. ^ a b McCormick, Erin (5 June 1998). "Runway expansion at SFO could mean filling Bay". San Francisco Examiner. Retrieved 4 August 2017. ^ Martin, John (23 November 1998). "Opinion: SFO Director Makes a Plea for Bay Fill". San Francisco Chronicle. Retrieved 4 August 2017. ^ McCabe, Michael (31 July 1999). "Sierra Club Opposes SFO Bay-Fill Plans / Airport says runway options vary". San Francisco Chronicle. Retrieved 4 August 2017. ^ California State Assembly. "An act to add and repeal Sections 21085.7 and 21151.10 of the Public Resources Code, relating to environmental quality". 1999–2000 Session of the Legislature. Statutes of California. State of California. Ch. 925 p. 6919. ^ Johnson, Huey D. (5 May 2000). "Opinion: Bay fill for runways a dismal idea". San Francisco Chronicle. Retrieved 4 August 2017. ^ Wilson, Marshall; Pence, Angelica (25 April 2001). "SFO expansion backers argue for bay fill-in plan / Foes attack study, Feinstein endorses it". San Francisco Chronicle. Retrieved 4 August 2017. ^ Wilson, Marshall (31 July 2001). "Roar of disapproval for SFO runway expansion plans". San Francisco Chronicle. Retrieved 4 August 2017. ^ Wilson, Marshall; McCabe, Michael (24 November 1998). "SFO's Plan For New Runways / Wetlands trade-off for bayfill proposed". San Francisco Chronicle. Retrieved 4 August 2017. ^ wilson, Marshall (4 February 1999). "New Price Tag On SFO Runways Tops $2 Billion". San Francisco Chronicle. Retrieved 4 August 2017. ^ "Press Room, Our History, Openings/Closings". Southwest Airlines. Retrieved August 28, 2015. ^ Cabantuan, Michael (June 22, 2003). "History is Here – New Line Creates Transit Hub, Link to Future". San Francisco Chronicle. Hearst Communications. pp. A–1. Retrieved August 3, 2009. ^ Raine, George (October 5, 2007). "Airbus Jumbo Jet Makes Test Landing at SFO". San Francisco Chronicle. Hearst Communications. pp. C–1. Retrieved August 3, 2009. ^ "Airport of the Year 2008: Regional Results". Airport of the Year 2008. Skytrax Research. July 28, 2008. Archived from the original on July 30, 2008. Retrieved August 3, 2009. ^ "Airport of the Year 2009: Regional Results". Airport of the Year 2009. Skytrax Research. June 9, 2009. Archived from the original on May 29, 2010. Retrieved September 9, 2009. ^ "New SFO control tower will have a torch-like air". Retrieved May 11, 2015. ^ King, John (27 June 2012). "New SFO control tower will have a torch-like air". San Francisco Chronicle. Retrieved 9 August 2017. ^ FOX (2016-10-11). "New control tower at San Francisco airport dedicated – Story". KTVU. Retrieved 2017-07-24. ^ "Getting Through Airport Security with CLEAR". On the Ground Travel. December 11, 2012. Retrieved January 31, 2013. ^ "Clear Lanes Are No Longer Available". Clear. Verified Identity Pass, Inc. June 25, 2009. Retrieved August 3, 2009. ^ a b c d e f "Weather and Operations at SFO: A Primer for the Media" (PDF). San Francisco International Airport. January 2010. Retrieved 5 August 2017. ^ "Airport Diagram" (PDF). Archived from the original (PDF) on 2017-12-01. ^ "West Plan". San Francisco International Airport. Retrieved 5 August 2017. ^ a b "Formation landing with a Boeing 747-400 at SFO". AvGeekery [blog]. Retrieved 5 August 2017. ^ "Southeast Plan". San Francisco International Airport. Retrieved 5 August 2017. ^ "Fly Quiet Program – Jon C. Long Fly Quiet Awards". flySFO.com. San Francisco International Airport. Retrieved August 28, 2015. ^ "Residential Sound Insulation Program". SFO – Aircraft Noise Abatement Office. BridgeNet International. September 1, 2009. Archived from the original on December 24, 2009. Retrieved September 12, 2009. ^ Payne, Andy T. "San Francisco International Airport: Gateway to the Golden Gate, Part 1: 1927–1959". Yesterday's Airlines. Retrieved 9 August 2017. ^ Payne, Andy T. "San Francisco International Airport: Gateway to the Golden Gate, Part 2: 1959–1978". Yesterday's Airlines. Retrieved 9 August 2017. ^ a b Payne, Andy T. "San Francisco International Airport: Gateway to the Golden Gate, Part 3: 1978–2015". Yesterday's Airlines. Retrieved 9 August 2017. ^ "Connecting at San Francisco – Airport Maps and Connections – Check-In & Immigration". Air New Zealand. 2013-10-08. Retrieved 2015-12-17. ^ McGinnis, Chris (2014-11-19). "New "secret passageway" at SFO – Chris McGinnis". Web.archive.org. Archived from the original on September 9, 2015. Retrieved 2015-12-17. ^ "New options for Delta flyers at SFO – TravelSkills". Web.archive.org. 2014-11-12. Archived from the original on March 16, 2015. Retrieved 2015-12-17. ^ "A Masterpiece In Progress: Terminal 1 Renovation Breaks Ground at SFO | San Francisco International Airport". FlySFO | San Francisco International Airport. ^ "San Francisco Public Library – Bay Region Business". Archive.org. Retrieved 2013-07-06. ^ "negative: San Francisco International Airport (SFO), dedication of South Terminal". SFO Museum. 15 September 1963. Retrieved 9 August 2017. ^ "Projects Slated at SF Airport". Los Angeles Times. July 13, 1958. Retrieved June 14, 2012. ^ a b c Hough, Bill (14 July 2016). "San Francisco Airport Breaks Ground on Terminal Reconstruction". Airways. Retrieved 9 August 2017. ^ "Feb 72 / Rotonda A". SFO Museum. February 1972. Retrieved 9 August 2017. ^ Moxom, Marshall (2 July 1971). "Elevated Roadway Construction & Rotunda "A" Const". SFO Museum. Retrieved 9 August 2017. ^ San Francisco Airport Architects (29 January 1968). "SFO Rotunda Plans / Sections 9". SFO Museum. Retrieved 9 August 2017. ^ Friedman, Howard A.; Reitherman, Robert. Successful Architecture: Selected Works and Thought of Howard A. Friedman. H. Friedman Family. p. 66. Retrieved June 14, 2012. ^ "Tabular LT Institutional Facilities" (PDF). Archived from the original (PDF) on November 29, 2014. Retrieved July 6, 2013. ^ "Terminal 1 Redevelopment". flySFO.com. San Francisco International Airport. Retrieved August 28, 2015. ^ "CMAA Terminal 1 Redevelopment Program" (PDF). November 29, 2012. Retrieved August 28, 2015. ^ Sabatini, Joshua (March 21, 2018). "SFO Terminal To Be Renamed in Honor of Harvey Milk". San Francisco Examiner. Retrieved March 22, 2018. ^ a b McCarthy, Allison (April 4, 2011). "A First Look at SFO's New Terminal 2". 7x7.com. Retrieved 2013-07-06. ^ San Francisco International Airport Competition Plan (PDF) (Report). San Francisco International Airport. August 8, 2000. Archived from the original (PDF) on May 18, 2011. Retrieved July 14, 2013. ^ a b Raine, George (13 May 2008). "SFO's old international terminal to fly again". San Francisco Chronicle. Retrieved 9 August 2017. ^ Manekin, Michael (July 8, 2008). "SFO Brings Ghost Terminal Back From the Dead". San Mateo County Times. Bay Area News Group. Retrieved August 3, 2009. ^ "SFO's renovated Terminal 2 is set to open April 14 and will house Virgin America and American Airlines". ABC7 News KGO-TV. San Francisco, California. February 10, 2011. Retrieved July 6, 2013. ^ Coté, John (6 April 2011). "SFO Terminal 2 ready for takeoff". San Francisco Chronicle. Retrieved 9 August 2017. ^ "Five New Public Artworks to Debut at San Francisco International Airport's New Terminal 2". Sfartscommission.org. Retrieved 2013-07-06. ^ "SFO's Terminal 2 Set to Re-Open in April" (Press release). San Francisco International Airport. 10 February 2011. Retrieved 9 August 2017. ^ Allday, Erin (19 September 2008). "SFO releases terminal renovation plans". San Francisco Chronicle. Retrieved 9 August 2017. ^ King, John (8 February 2011). "SFO terminal plan may make security check less grim". San Francisco Chroncile. Retrieved 9 August 2017. ^ Lucchesi, Paolo (24 March 2011). "SFO Terminal 2 to include sustainable food". San Francisco Chronicle. Retrieved 9 August 2017. ^ Lucchesi, Paolo (6 April 2011). "SFO Terminal 2 dining a local, gourmet bounty". San Francisco Chronicle. Retrieved 9 August 2017. ^ "Airlines at SFO". San Francisco International Airport. Retrieved August 28, 2015. ^ "Airport Undergoes Marathon Expansion". Engineering News-Record. McGraw-Hill. 200 (1): 18. 1978. ^ "North Terminal construction begins at San Francisco International Airport". SFO Museum. 22 April 1971. Retrieved 9 August 2017. ^ "North Terminal completed at San Francisco International Airport". SFO Museum. 1 January 1981. Retrieved 9 August 2017. ^ "San Francisco International Airport's domestic terminals will be referred to by number beginning October 1" (PDF) (Press release). San Francisco Airport Commission. 28 September 2001. Retrieved 9 August 2017. ^ Raine, George (20 September 2007). "SFO harnesses solar power for Terminal 3". San Francisco Chronicle. Retrieved 9 August 2017. ^ "American to Relocate Operations at SFO to New Terminal 2". Airlines and Destinations. September 8, 2010. Retrieved December 17, 2015. ^ "Minutes" (PDF). San Francisco Airport Commission. 1 March 2011. Retrieved 9 August 2017. ^ FY14/15 Five-Year Capital Plan (PDF) (Report). San Francisco International Airport. Archived from the original (PDF) on October 14, 2012. Retrieved January 31, 2013. ^ Cabanatuan, Michael (24 January 2014). "SFO terminal revamp ready for takeoff". San Francisco Chronicle. Retrieved 9 August 2017. ^ Yakel, Doug (January 24, 2014). "Join the E-Volution – SFO Re-Opens Boarding Area E" (Press release). San Francisco International Airport. Retrieved January 24, 2014. ^ Bigelow, Catherine (28 January 2014). "United SFO terminal upgrades to 1st class glitz". San Francisco Chronicle. Retrieved 9 August 2017. ^ "San Francisco International Airport Boarding Area E". City and County of San Francisco. March 19, 2012. Retrieved January 31, 2013. ^ a b "Fact Sheet – International Terminal" (PDF). flySFO.com. San Francisco International Airport. January 30, 2007. Archived from the original (PDF) on May 21, 2009. Retrieved August 3, 2009. ^ Armstrong, David (October 7, 2003). "Terminal Gastronomy – New Plan Brings Icons of the Bay Area's Food-Loving Culture to the S.F. Airport". San Francisco Chronicle. Hearst Communications. pp. B–1. Retrieved August 3, 2009. ^ "San Franscisco Airport Commission Minutes" (PDF). 2005-11-01. Archived from the original (PDF) on 2015-12-24. Retrieved 2017-12-10. ^ Armstrong, David (July 15, 2004). "Super-Size Skies – SFO Says It's Ready for a 555-Person Plane Arriving in 2006". San Francisco Chronicle. Hearst Communications. pp. C–1. Retrieved August 3, 2009. ^ a b "A380 at SFO". May 9, 2011. Retrieved March 21, 2013. ^ "Mission and History". San Francisco International Airport. Retrieved 9 August 2017. ^ Todd, Gail (19 January 2012). "S.F. International Airport: Also an art museum". San Francisco Chronicle. Retrieved 9 August 2017. ^ "Public Art Map". SFO Museum. Retrieved 9 August 2017. ^ Xiao, An (21 November 2013). "Curating at the Airport: The SFO Museum". Hyperallergic. Retrieved 9 August 2017. ^ a b "Flight Schedules". Air Canada. ^ "Flight Timetable". Retrieved 13 April 2018. ^ "Time Table - Air India". Retrieved 13 April 2018. ^ "Air Italy – Timetable". Retrieved 13 December 2018. ^ "Flight schedules - Air New Zealand". Retrieved 13 April 2018. 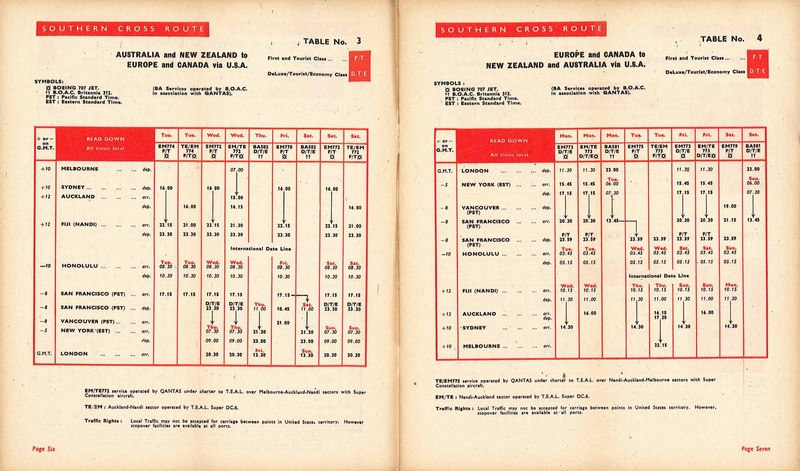 ^ "Timetables [International Routes]". Retrieved 13 April 2018. ^ a b "Flight schedules and notifications". Retrieved 13 April 2018. ^ "Routes of Service". Retrieved 13 April 2018. ^ "Check itineraries". Retrieved 13 April 2018. ^ "Flight Timetable". Cathay Pacific. ^ "Timetable | China Airlines". Retrieved 13 April 2018. ^ "Schedules and Timetable". China Eastern Airlines. ^ "Timetable". Retrieved 13 April 2018. ^ "Flight Schedule". Copa Airlines. ^ a b "FLIGHT SCHEDULES". Retrieved 13 April 2018. ^ Liu, Jim. "El Al delays San Francisco launch to May 2019". routesonline. UBM (UK) Ltd. Retrieved 27 May 2018. ^ "Timetables and Downlaods". EVA Air. ^ "Flight Schedules". Retrieved 13 April 2018. ^ "Finnair flight timetable". Retrieved 13 April 2018. ^ "Timetable - French Bee". Retrieved 13 April 2018. ^ "Frontier Airlines Launches 30 New Routes Nationwide". Retrieved 30 March 2019. ^ "Frontier Airlines annoucnced new non-stop flights from Cleveland-Hopkins to Charleston and San Francisco". Retrieved 30 March 2019. ^ "Frontier". Retrieved 13 April 2018. ^ "Destinations". Retrieved April 13, 2018. ^ "Flight Schedule". Retrieved 13 April 2018. ^ "Flight times - Iberia". Retrieved 13 April 2018. ^ "Japan Airlines Timetables". Retrieved 13 April 2018. ^ "JetBlue Airlines Timetable". Retrieved 13 April 2018. ^ "Flight arrivals and depatures". Retrieved 7 April 2018. ^ "Qantas Timetables". Retrieved 13 April 2018. ^ "Timetable - SAS". Retrieved 13 April 2018. ^ Field, James. "Southwest Boosts Ontario With Four Daily Flights To San Francisco". Retrieved 30 March 2019. ^ "Check Flight Schedules". Retrieved 13 April 2018. ^ "Sun Country Airlines". Retrieved April 13, 2018. ^ Edmondson-Jones, Gareth (December 13, 2018). "TAP Air Portugal to Add a Third New U.S. Route for 2019: San Francisco Becomes TAP's 8th North American, and Only West Coast, Gateway". GlobeNewswire. GlobeNewswire, Inc. Retrieved December 13, 2018. ^ "Timetable - Thomas Cook Airlines". Retrieved 13 April 2018. ^ Marla Matzer Rose (2018-10-15). "Columbus lands nonstop United Airlines flight to San Francisco - News - The Columbus Dispatch - Columbus, OH". Dispatch.com. Retrieved 2018-11-17. ^ a b "United further expands San Francisco international service in 2019". RoutesOnline. December 12, 2018. Retrieved December 12, 2018. ^ "United expands Fairbanks service in S19". Routesonline. Retrieved 2018-11-17. ^ a b "Timetable". Retrieved 13 April 2018. ^ "Interactive flight map". Retrieved 13 April 2018. ^ "Volaris Flight Schedule". Retrieved 13 April 2018. ^ "ABX Air". Retrieved March 24, 2013. ^ "Asiana Cargo Schedule". Retrieved August 28, 2015. ^ "China Airlines Cargo Schedule". Retrieved March 27, 2013. ^ "EVA Air Cargo Schedule" (PDF). p. 8. Retrieved May 23, 2013. ^ "Korean Air Cargo". Retrieved March 22, 2013. ^ "NCA Flight Schedule" (PDF). Nippon Cargo Airlines. Summer 2013. Retrieved June 29, 2013. ^ a b "RITA | BTS | Transtats". transtats.bts.gov. Retrieved January 31, 2019. ^ "BTS Air Carriers : T-100 International Market (All Carriers)". Retrieved June 17, 2017. ^ "Annual Report" (PDF). media.flysfo.com. 2017. ^ "Airtrain FAQ". flySFO.com. San Francisco International Airport. Retrieved August 3, 2009. ^ "BART San Francisco Int'l Airport Station Schedule". San Francisco Bay Area Rapid Transit District. November 28, 2007. Retrieved December 31, 2009. ^ "SFO – Millbrae Caltrain Shuttle". Archived from the original on December 11, 2003. Retrieved 2003-12-11. ^ "Public Transit". flySFO.com. San Francisco International Airport. Retrieved August 3, 2009. ^ Route 399 Flyer/Timetable (PDF) (Report). Redwood City, CA: SamTrans. August 6, 2017. Retrieved December 4, 2017. ^ "Parking at a Glance". flySFO.com. San Francisco International Airport. Retrieved August 28, 2015. ^ "BART – Parking". Bart.gov. Retrieved 2013-07-06. ^ "Taxi Pick-Up Locations". flySFO.com. San Francisco International Airport. Retrieved August 3, 2009. ^ "Take a tour of the maintenance facility for United Airlines". YouTube. 2016-06-12. Retrieved 2018-05-19. ^ "America." Nippon Cargo Airlines. Retrieved on February 17, 2012. "900 North Access Road, San Francisco International Airport, San Francisco, CA 94128, U.S.A."
^ Flight International. April 2, 1964. 523. "Head Office: International Airport, San Francisco, California." ^ "World Airline Directory." Flight International. April 28, 1979. 1379. "Head Office: San Francisco International Airport, San Francisco, Ealif 94128, USA." ^ "ASN Aircraft accident Douglas DC-3A-197 NC16073 San Francisco International Airport, CA (SFO)". Aviation Safety Network. February 9, 1937. Retrieved July 21, 2013. ^ "Major SFO crashes". SFGate. July 6, 2013. Retrieved July 14, 2013. ^ "ASN Aircraft accident Boeing 377 Stratocruiser 10-34 N31230 Redwood City, CA". Aviation Safety Network. September 12, 1951. Retrieved July 21, 2013. ^ "ASN Aircraft accident Douglas DC-6 VH-BPE Half Moon Bay, CA". Aviation Safety Network. Retrieved July 21, 2013. ^ "ASN Aircraft accident Douglas DC-7C N740PA San Francisco International Airport, CA (SFO)". Aviation Safety Network. February 20, 1959. Retrieved July 21, 2013. ^ "ASN Aircraft accident Lockheed L-1049H Super Constellation N9740Z San Francisco International Airport, CA (SFO)". Aviation Safety Network. February 3, 1963. Retrieved July 21, 2013. ^ "ASN Aircraft Accident Lockheed L-1049H Super Constellation N6915C San Francisco". Aviation Safety Network. December 24, 1964. Retrieved January 31, 2013. ^ Aircraft Accident Report – Pan American World Airways, Boeing 747, N747PA (PDF) (Report). Washington, DC: National Transportation Safety Board. May 24, 1972. Retrieved August 3, 2009. ^ Aircraft Accident Report – Trans World Airlines, Inc., Boeing 707-331C, N15712 (PDF) (Report). Washington, DC: National Transportation Safety Board. September 13, 1972. Retrieved August 28, 2015. ^ "China Airlines B747SP Loss of Power and Inflight Upset". 2005-12-17. Archived from the original on 2005-12-17. Retrieved 2018-07-27. ^ Lee, Henry K (11 June 2007). "Turboprop narrowly misses hitting jet at SFO". San Francisco Chronicle. Retrieved 5 August 2017. ^ Aviation Incident OPS07IA004A Final Report (Report). National Transportation Safety Board. 30 November 2007. Retrieved 5 August 2017. ^ "NTSB Issues Update On Boeing 767 Cargo Airplane Fire" (Press release). National Transportation Safety Board. July 3, 2008. Retrieved August 3, 2009. ^ Aviation Accident DCA08MA076 Final Report (Report). National Transportation Safety Board. 28 March 2010. Retrieved 5 August 2017. ^ McClam, Erin; Arkin, Daniel (July 6, 2013). "Boeing 777 crashes while landing at San Francisco airport; 2 dead; scores injured". NBC News. Retrieved July 6, 2013. ^ Onishi, Norimitsu; Somaiya, Ravi (July 7, 2013). "Plane Crashes on Landing in San Francisco". The New York Times. Retrieved August 28, 2015. ^ "Boeing 777 crashes while landing at SFO". KTVU. Archived from the original on October 25, 2014. ^ "3rd fatality in Asiana flight crash". CBS News. July 12, 2013. Retrieved July 12, 2013. ^ Welch, William; Swartz, Jon M.; Strauss, Gary (July 6, 2013). "2 confirmed dead in San Francisco Airport crash". USA Today. Retrieved July 6, 2013. ^ "Asiana Crisis Management System" (Press release). Asiana Airlines. Archived from the original on January 25, 2014. Retrieved July 7, 2013. ^ Botelho, Greg (July 7, 2013). "2 die, 305 survive after airliner crashes, burns at San Francisco airport". CNN. Retrieved July 7, 2013. ^ "Crash of Asiana Flight 214 Accident Report Summary". National Transportation Safety Board. Retrieved 5 December 2017. ^ Hradecky, Simon. "Incident: Canada A320 at San Francisco on Jul 7th 2017, lined up with taxiway for landing". The Aviation Herald. Retrieved 15 July 2017. ^ "Taxiway Overflight Air Canada Flight 759 Airbus A320-211, C-FKCK San Francisco, California, July 7 2017" (PDF). National Transportation Safety Board. September 25, 2018. Retrieved February 17, 2019. ^ "Filming Locations for Bullitt (1968)". The Internet Movie Database. Archived from the original on May 11, 2012. Retrieved September 12, 2009. Wikimedia Commons has media related to San Francisco International Airport. 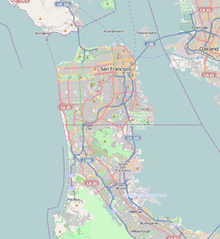 Wikivoyage has a travel guide for San Francisco International Airport.